Nipponophiles, alert! We know how impressed you are by all things Japanese, but the gorgeously figure-decorated Tako kites are just too special, right? Well, may be getting hands on the kites seem difficult as yet, but imagine getting those gorgeous Tako graphics on your tees! No, we're not joking. You just have to browse through Yellow Curtain's page. 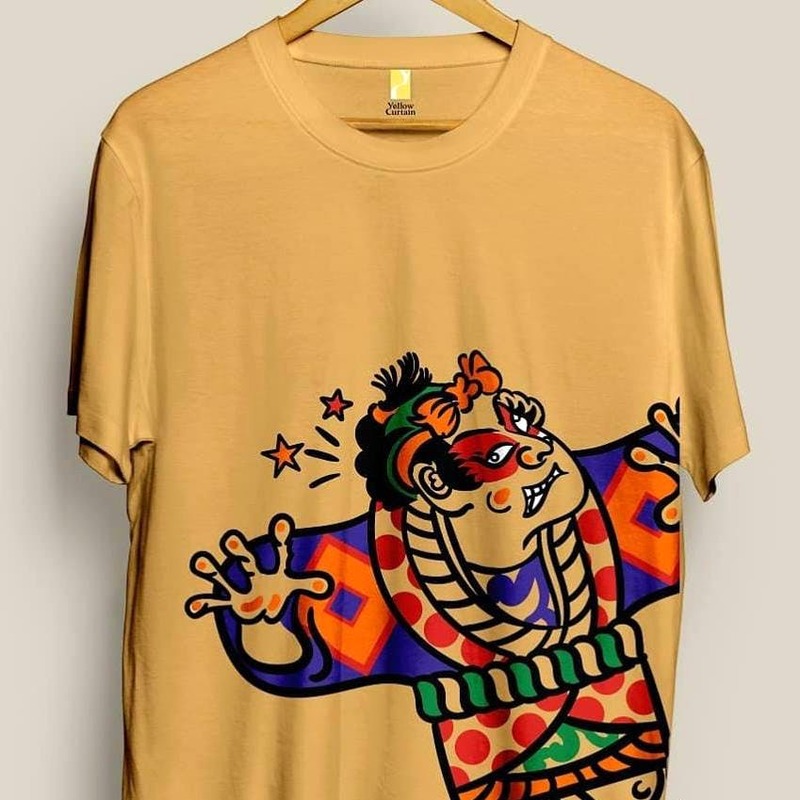 Tako graphics to Katana swords - don't go looking for Korean or Chinese store to find Japanese art-inspired items anymore because homegrown artists' collective brand Yellow Curtain is bringing Japanese art into tees and stationery simply for us Japanophiles. Funny, colourful and brilliantly Painted on fabric, we're completely hearting these tees; and have full plans of wearing and flaunting our geeky side. This aside, you'll find tees and stationery with mock quotes, whimsical doodles and quirky pop comic art too. Mugs, tees, stationery, totes, scarves and more - Yellow Curtain has turned all our whimsical imagination into tangible forms. Visva Bharati's Kala Bhavan artists Samarak Roy and Prarthana Roy along with NIFD artist Ujan Bhattacharya has come together to create merch that brings our silly doodles and fandom alive. Make your mock statement with their rad pop colour 'In Her Eyes' tote or show a side of your sass with their quirky 'Spider Hibiscus Girl' mug. Or better still wear one of their tastefully designed cotton tees with jumble doodles to wear your thoughts on your sleeves. Suffer from an incurable fetish for stationery like we do? Yellow Curtain has some fabulous notebooks and bookmarks made out of handmade paper with motifs like bright and cuddly cacti to comic crocs and red double decker buses. Better yet, this brand's commitment to help make a better future (a portion of every product price is donated to charities like Ashari, Helpage India and others) has it winning brownie points from us. The brand is also about to add Jawahar jackets and silk scarves very soon to their collection. So keep tabs to grab them at first go because a lot of their products gets sold out very soon. Mugs are priced at INR 250, tees at INR 500 and stationery from INR 250 onwards.